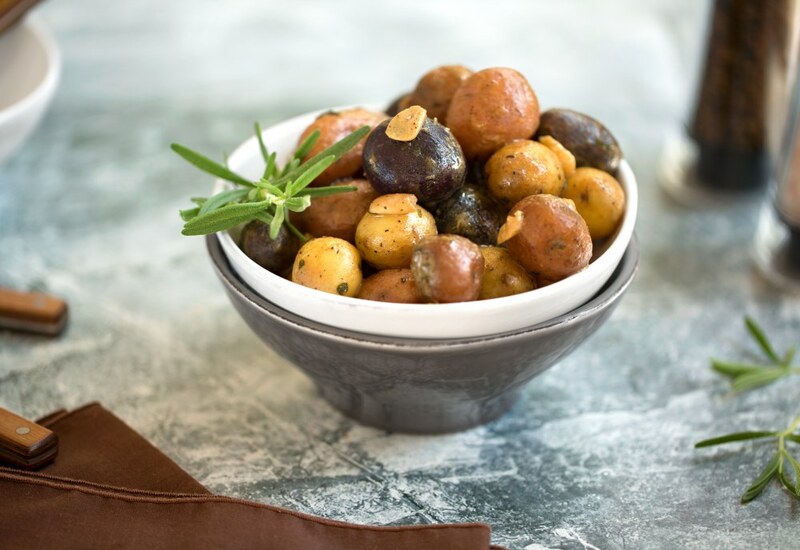 Add an air of elegance to your weeknight meals by serving these Pressure Cooker Rosemary and Garlic Potatoes alongside your favorite go-to main dish. The savory blend of garlic, rosemary, thyme and freshly ground black pepper is always a hit. The secret ingredient in this recipe is white miso paste. This Japanese paste adds a unique salty and tangy flavor. Miso is made from fermented soybeans and imparts incredible umami to any dish. Because miso is a fermented food, it is also a natural source of healthy probiotics. 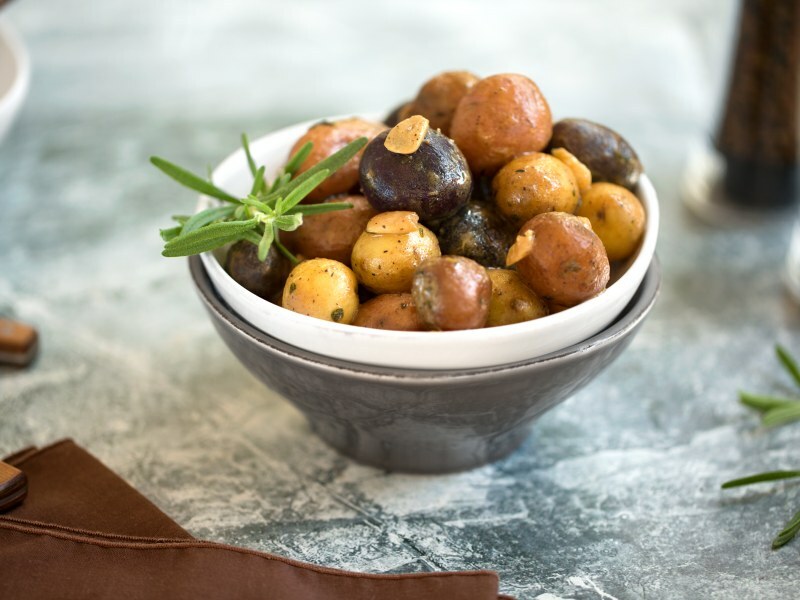 Marble potatoes are any variety of young, tender potatoes. They are sweet with a buttery flesh and thin skin. Often referred to as baby potatoes because they are generally smaller and picked even earlier than new potatoes. Just be sure to pierce the potatoes with a small knife before putting them in the pressure cooker to ensure they remain intact throughout the cooking process. Per Serving: 158 calories; 11g fat; 14.5g carbohydrates; 2g protein; 0mg cholesterol; 249mg sodium. I love rosemary on potatoes. It just so happens our neighbors have a very sturdy rosemary bush from which we are permitted to trim. I forgot to change my produce box, so we got potatoes (normally say 'no' to them for carb-y reasons) this week. Used elephant garlic instead of actual garlic. They were delicious. Great texture. Not too mushy. Loved 'em! I would have never thought to use miso paste with potatoes, and this is a revelation! So delicious and done in the pressure cooker in a snap. These rosemary and garlic tomatoes are delicious! I love making this recipe with red potatoes. I swapped out vegetable broth for chicken broth, and served it with pressure cooker rosemary chicken. Definitely plan to to make this again! I'd never used miso paste before and now am searching for all other recipes using it! 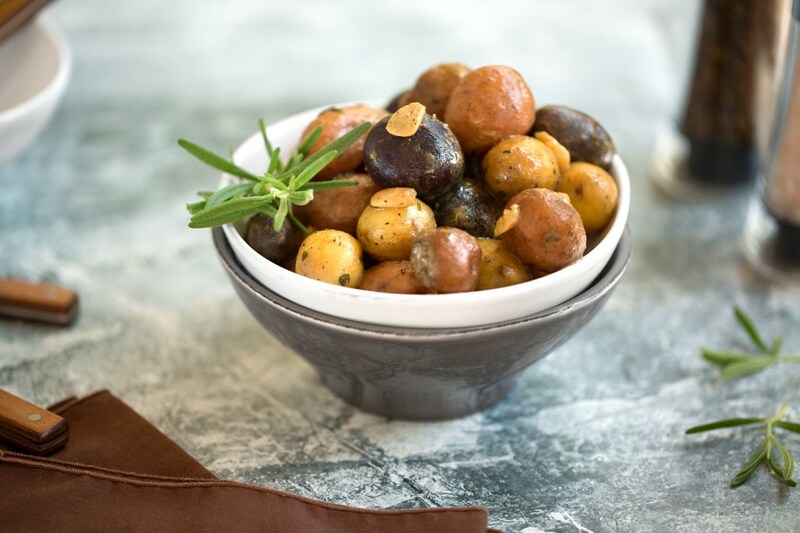 These potatoes were done so fast and I loved the strong garlic flavor! This easy was an easy dish, but I added a little more garlic since I love everything super garlicky! I also subbed white miso paste for tahini and it was fab! I served this side dish with a chicken main and they paired really well together! My mom is vegan and lives with us so I am always looking for food that will fit her restrictions. This was easy to make, delicious, and everyone in the family found it to be a great dish! I substituted tahini and a little aminos for the white miso paste. It was a hit!